Hyper Light Drifter is beautiful, mysterious, and hard as hell. To some, that difficulty is central to its design. To others, it’s an obstacle preventing them from enjoying its other parts. Since release, the developers have tried to patch the game to appease both audiences, but it’s been a challenge. Overcoming difficulty in Hyper Light Drifter rewards you with the chance to overcome more difficulty. There are people who are going to love this—I loved it, at least for a while. But it’s the kind of joy that’s best for a very specific subset of people. Some might not have the time, patience, or manual dexterity to sit through these fights again and again. If you’re struggling, as I did, I would definitely recommend taking a break—I’ll always remember that one fight I couldn’t beat until I gave up and went to bed, only to wake up to beat it on the first try at 7 AM. He’s not alone. 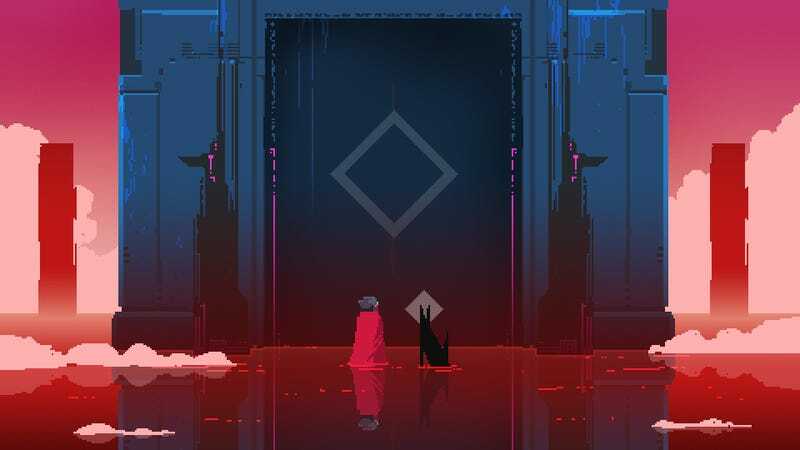 I’ve talked to friends intrigued by Hyper Light Drifter’s world, only to walk away frustrated at their inability to play it. The question facing the developers was if they should do anything about it. The first alteration—invincibility frames for dashing—was the most significant. Previously, dashing around in Hyper Light Drifter meant nothing if you didn’t literally avoid an attack or projectile. Now, there was a brief window of wiggle room. It’s an idea modernly popularized by Dark Souls, and it’s why you see players rolling; by doing so, the“invincibility frames” allow them to dodge an attack that should theoretically hit them. “Jeezuz thank you,” said the first comment on the patch notes. “Were there that many complaints on difficulty?” said the third. And thus, the parameters of the debate were set, resulting in 18 pages and 174 comments over the patch. Were the changes made because the designers felt it was better for the game, or simply because some people had complained? (You can see this tension playing out in gaming culture debates, like that Overwatch pose.) Some celebrated the newfound accessibility, others grumbled about goal posts for success being changed. Others wished for a compromise: make the changes optional. Acknowledging that “challenge is great” and a toggle could come in an upcoming patch, designer Alx Preston attempted to explain the changes. A few days later, another patch went live for Hyper Light Drifter, alongside a lengthy blog post by Preston. The developers seemed to recognize it would have helped to give more context to their design decisions. They didn’t completely walk back the changes, but health kits were no longer recharged at warp pads and healing was given a tighter window. And while they reduced the number of invincibility frames during dashing, it was still there. That change was staying, and Preston reiterated his feeling that it improved the flow of combat. The developers could have made these changes optional, but instead, they’re part of the core design. Preston said it’s possible the game will get a new difficulty mode to be “inclusive to more players who want to experience the world,” but they’re still discussing the idea. “I realize we can’t please everyone, and we don’t aim to do so,” said Preston.